This week, students at three elementary schools will hear all about art cars, writing, publishing, illustrating, creativity and inspiration when I show up to present my children’s book, Arthur Zarr’s Amazing Art Car. The lucky schools are Garden Oaks Montessori Magnet, Travis Elementary School, and St. Stephen’s Episcopal School. And the timing could not be better since Houston’s 30th Art Car Parade will roll at 2:00 pm Saturday, April 8, downtown along Smith St.
I’ve been presenting my book to various schools in Houston and beyond since last year’s launch. Just this year alone, I’ll have been to about 20 schools by the end of May! WOW! You can check out my calendar here. 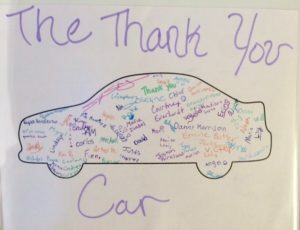 I speak to students about how I got the idea for my book (hint: my car sports 16 bumper stickers and counting), how they can come up with their own amazing story ideas, the writing and publishing process, and, of course ART CARS! I also reveal a few “insider secrets” about the making of my book. My illustrator, Bill Megenhardt, often accompanies me on these school visits. And there is always a real art car for the students to see up close! The student artwork from Atlanta’s Fernbank Elementary was AMAZING! 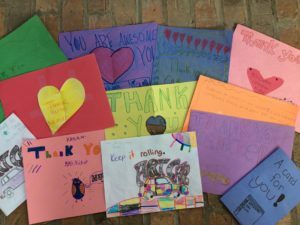 The best part is getting thank-you letters from the students. One fantastic school—Fernbank Elementary in Atlanta, Georgia—presented me with a huge binder full of their own art car illustrations! It’s also fun to see how creative the schools get in honor of my visit. 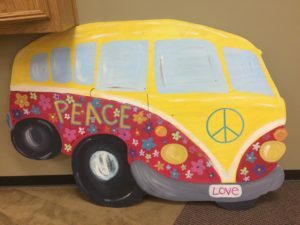 They build their own miniature art cars, hang art car banners down their hallways, paint wooden cut-out art car signs, and more. Sometimes I can’t believe my little ole’ book encouraged some of these ideas! A lot of folks ask me how I wrote and published my book. In case you don’t know, I’ll explain how it all started back in 2015. I moved to Houston about twenty years ago, and I had never seen an art car until I landed in this awesome city. These rolling wonders fascinated me, and over the years I took photographs whenever I spotted one “in the wild.” So, I don’t drive an art car myself, but the concept for Arthur Zarr came to me one morning during rush hour while I was driving my teenage son, Will, to school. A creative parent made this painted wood car in honor of my visit to Southfield School in Shreveport, Louisiana. I’ve highlighted, notated and dog-eared this book through at least three full readings! Simply put, I had a playful idea, and I acted on it. Immediately. That very day. I didn’t wait to finish the laundry or to load the dishwasher for the millionth time. I decided to say “yes” to my idea. Most of us have moments of inspiration, but we’re often too tired or too busy to do anything about it. Right? 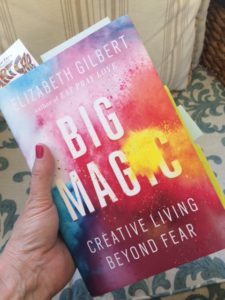 Best-selling author ELIZABETH GILBERT talks about this in her book, Big Magic. She writes, “Art is a crushing chore and a wonderful privilege. The work wants to be made, and it wants to be made through you.” She goes on to say that she believes “ideas spend eternity swirling around us, searching for available and willing human partners.” I believe that I was an agreeable human that day during my morning carpool. Themes include recycling, outsider art, friendship building, community pride, and the power of imagination. There’s an ABC motif that runs throughout the book—Arthur adds objects to the car alphabetically. At the end of the book, I included a page that gives readers the “History of Art Cars.” Teachers and librarians appreciate that I added this non-fiction summary, as it helps them tie the story into their curriculum and possible assignments. I explain more about school visits here. The final result: Arthur Zarr’s Amazing Art Car, a hardcover book with dust jacket, published by my very own company, Twenty-Eight Creative (ISBN: 978-0-9961150-0-1; $19.99). It is available for purchase directly from me (there’s a PAYPAL LINK on this website under the BOOKS tab) or at various retail outlets and online through Amazon. Houston shops that carry the book include: Brazos Bookstore, Bering’s Hardware (Westheimer location), and The Beer Can House. I love my thank you letters! Keep it rolling! If you have an idea that you think has some legs to it, please grab hold and don’t let go! The creative process is a fun—and sometimes exhausting—pursuit. But it’s one that I don’t regret following. Liz Gilbert believes “we are all capable at times of brushing up against a sense of mystery and inspiration in our lives … You can’t explain it. But it felt as if you were being guided.” That’s what I experienced when I was creating Arthur Zarr’s Amazing Art Car. So, I’ll tell you the same thing I tell the students when I speak at schools: Be like Arthur Zarr … Be amazing! The laundry and dishes can wait. 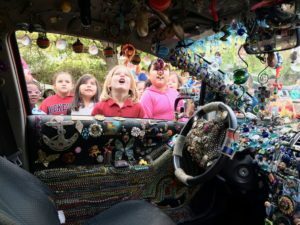 Houston-based author of ARTHUR ZARR'S AMAZING ART CAR—the first book for children about art cars. I do Author Visits at elementary schools. SCBWI member.